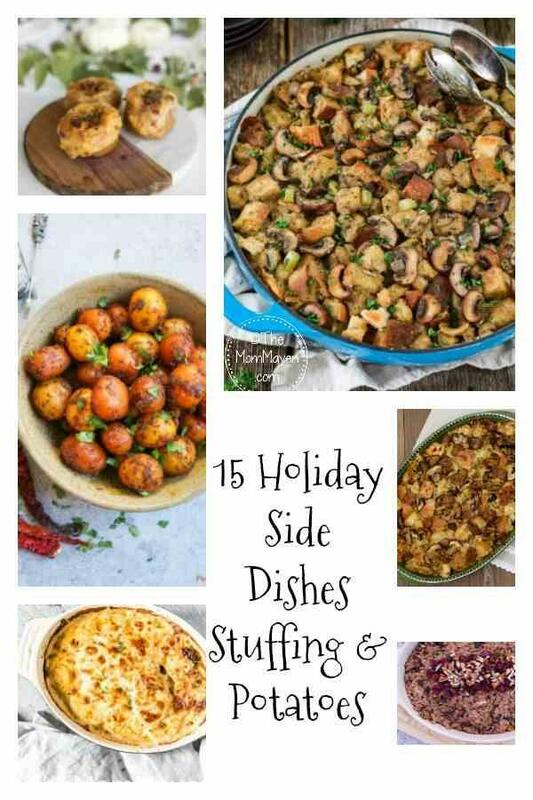 Last week I shared 17 Holiday Side Dishes Fruits and Vegetables and today I am bringing you the rest of the sides, Stuffing and Potatoes. First, let’s settle the debate between stuffing and dressing. Stuffing is what is cooked inside the fowl and dressing is cooked outside. I prefer stuffing over dressing because in my experience, stuffing is more moist and has more flavor than dressing. Which do you prefer? Let’s start off with a Vegan Sourdough Bread Stuffing from Vegan Huggs. 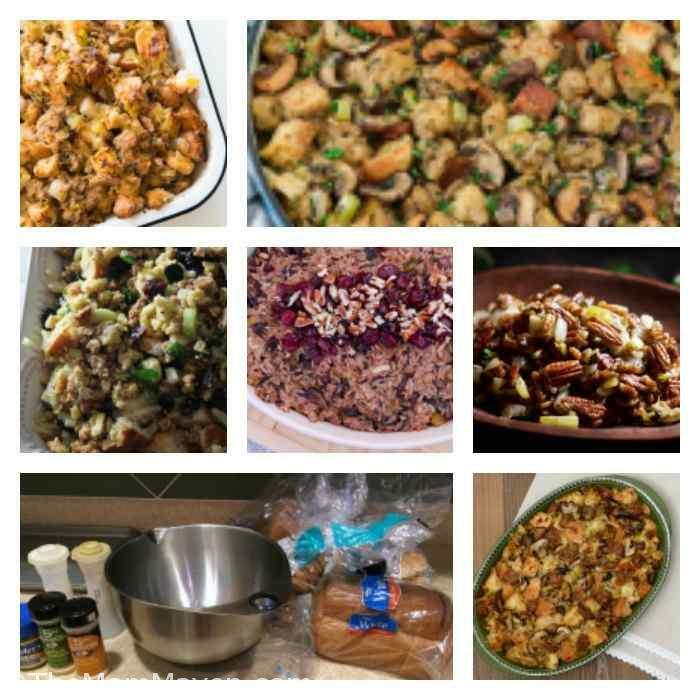 Simply So Healthy shares their Lo-Carb Pecan Stuffing recipe. This Pear, Sage, and Sausage Stuffing comes from The Flavor Blender. Older mommy Still Yummy offers up her Mushroom, Leek, and Turkey Sausage Stuffing. My favorite stuffing is my mom’s Simple Turkey Stuffing Recipe from right here on The Mom Maven. This Apple and Mushroom Wild Rice Stuffing from I am a Honey Bee sounds interesting. It’s very different from anything I’ve ever tried. I have to admit that until I started gathering recipes for this post, I never knew you could have meat in stuffing! This Italian Sausage Stuffing with Dried Cranberries and Cherries from Delicious Table sounds delicious! Let’s start off with a Traditional Sweet Potato Casserole from Down Redbud Drive. 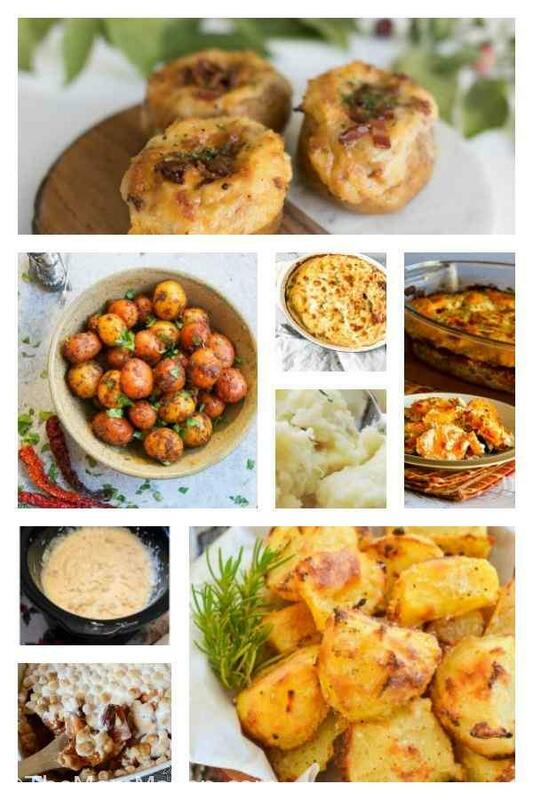 A Virtual Vegan shares her Healthy No Oil Crispy Roasted Potatoes. I know cauliflower is all the rage, this mix of cauliflower and potatoes may be the best veggie hiding trick of the year! Check out the Mashed Garlic CauliTatoes from My Midlife Kitchen. Back to sweet potatoes we go with this Sweet Potato Gratin with Goat Cheese, Parmesan, and Thyme from Kalyn’s Kitchen. Chef Sous Chef shared these amazing Truffled Twice Baked Potatoes. Scalloped Potatoes are always a big hit! Try this recipe from Recipes From a Pantry. We are having about 13 people at our family Thanksgiving this year. I’ll be making The Mom Maven’s Crockpot Mashed Potatoes for that hungry crowd. Looking for something unique to add to your holiday table? Try making these Spicy Bombay Potatoes in your InstaPot. Thanks for the shout-out for my Sweet Potato Gratin with Goat Cheese and Thyme!